When Cynthia Waltenbaugh Kidder ’78 gave birth to her youngest son, she was presented with a list of expectations—but not the kind of list most parents receive. Jordan was born with Down syndrome. Drawing on her skills from previous positions in sales, Kidder started a placement agency for jobseekers with disabilities. “We did thirty-two placements for people with significant disabilities into jobs I am certain they would not otherwise have been placed,” she says. She was frustrated, however, at many corporations’ reluctance to hire bright, capable applicants with disabilities. That experience prompted Kidder to found Band of Angels in 1994. Her first project, the “Beautiful Faces” calendar, features photographs of children with Down syndrome. “I was trying to find a way to put children with difference in front of people 365 days a year,” she explains. First printed in 1995, the calendar was picked up by Barnes & Noble in 1997. The Band of Angels Web site (www.bandofangels. com) also offers greeting cards, books, and information about the organization’s scholarship fund. The feedback from grateful parents was overwhelming. “It became apparent that I needed to find a funding mechanism enabling me to put the book in parents’ hands the day their child was born,” she says. She sought corporate sponsorship, establishing connections with corporations like Marshall Fields (now Macy’s) and Cadillac. Today, Band of Angels supplies information to local support groups, which connect with area hospitals to identify parents who need information. About 5,000 Down syndrome babies are born in the United States each year. Kidder estimates her organization reached 40 percent of these parents in 2005. Kidder’s advocacy work has garnered international attention, recently earning her an award from Woman’s Day magazine. 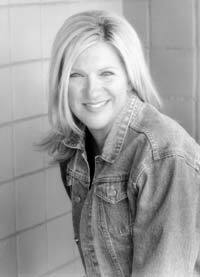 She was also named one of fourteen Michiganians of the Year for 2007 by the Detroit News. To keep her organization thriving requires creativity and risk taking, qualities that were cultivated at Allegheny. “The environment at Allegheny is very accepting and encourages people to try new things,” she says. Although a math and science whiz in high school, at Allegheny she majored in English, immersed herself in theatre, tried her first art class, and, on the encouragement of her advisor, signed up for voice lessons. Kidder will be tapping into that creativity as she tackles new challenges. Her next goal is to work with corporate human resources offices to instruct them on where individuals with Down syndrome can make a good fit in the workplace. “We also need to be thinking about independent living support services for our young adults,” she says.